Universal Studios: Closest We Can Get To Being Movie Stars? Many a child has dreamt of being a movie star. I suppose even some adults do have these dreams. While only a very small percentage of these dreamers will ever get to live their fantasies, we can have a taste of the life behind the movies in Universal Studios theme parks! Universal Studios Hollywood has been dubbed the “Entertainment Capital of L.A.” for good reason. Visitors can have a blast at the theme park, tour the studios where some of the greatest movies were filmed, and experience Hollywood at its best. They always have something new to offer, and since Halloween is coming up, one of the most looked forward to events is Halloween Horror Nights. Some of the most popular attractions are the mazes (all new! ), the terror tram, and more scare zones. There is also a Universal Studios site in Orlando, which also offers Halloween Horror Nights. There are two theme parks, Islands of Adventure and Universal Studios Florida. They are both unique in their own and offer totally different adventures. Needless to say, you have to visit both theme parks to get the complete Universal studios experience! 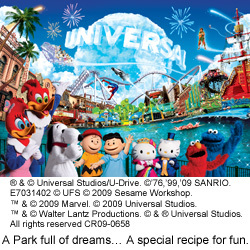 Did you know that there is also Universal Studios Theme Park in Japan? Yup, for those who are in the eastern part of the world, the Universal Studios experience is within reach. This theme park has the best ride attractions: Hollywood Dream, The Amazing Adventures of Spiderman, and Jurassic Park. It also has shows such as the Magical Starlight Parade, Peter Pan’s Neverland, and Wicked (Wizard of Oz). If you are planning to visit Universal Studios Japan, you do not have to worry about hotels. Just visit the comprehensive list of hotels near the park that Japanican has put together.